One month ago, on September 29th, Beveridge Place Pub in West Seattle (one of Seattle’s best local craft beer bars) kicked off their annual ‘Hoptoberfest’. More than just a celebration of Washington-brewed IPAs, this month-long festival is their way of selecting their House IPA for the next year. If you’re a regular at Beveridge Place Pub, then you know how this works. For the uninitiated, Beveridge Place whittles down over 48 Washington IPAs to just 3 finalists based on your votes. Today and tomorrow is your last chance to vote on those 3 finalists, which must be done by blind ballot. Order a taster try with all 3, and vote for your favorite without knowing which is which. This year’s 3 finalists are: Reuben’s Brews‘ Crikey IPA, Georgetown Brewing‘s Bodhizafa IPA and Counterbalance Brewing IPA. Visit Beveridge Place Pub today or tomorrow to have your blind tray and cast your vote. I’ve already voted once, but I’ll probably go back and cast one more vote before the end of tomorrow. October was, as usual, a big, hoppy, IPA-filled month for Beveridge Place Pub. For those not in the know, each October Beveridge Place holds their annual ‘Hoptopberfest’. This month-long Washington IPA competition, decided by your votes, is how Beveridge Place selects their ‘House IPA’ for the next year. Now, with Hoptoberfest voting nearly complete, Beveridge Place turns their attention to their last seriously hop-filled event of the season: the 10th Annual IPA Cask-O-Rama. This event is heaven for those who love Cask IPAs. 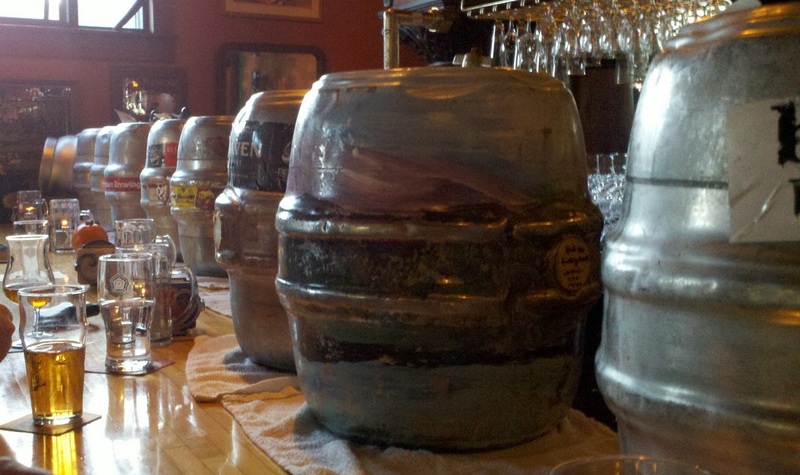 Beveridge Place will cover the bartop with at least 23 cask IPA from Washington breweries for you to enjoy.